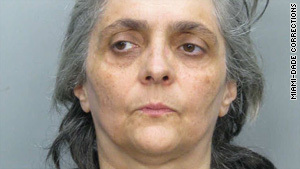 Laura Caballero falsely identified herself as a director of St. Filumena Catholic Church, in Eustis, Florida, authorities said. Miami, Florida (CNN) -- A six-month ordeal has ended for a Florida couple with the return of their 2-year-old daughter who, authorities said, was whisked off to Argentina without permission by a church acquaintance of the parents. "The baby is in very good condition. The parents were completely overjoyed. They haven't seen her since July," said Lt. John Herrell of the Lake County, Florida, Sheriff's Office after little Maria Lopez-Vasquez was reunited with her parents Tuesday night. The child arrived in Orlando, where parents Jose Ochoa-Avalos and Adai Lopez-Vasquez were waiting. Through an interpreter, they spoke to reporters and described the past year as "triste," Spanish for sad. The family's plans now are simple. "Just be with her in the house," the mother, Adai, said in Spanish. The story begins in 2007, when the couple was befriended by Laura Caballero, who identified herself as a director of St. Filumena Catholic Church, in Eustis, Florida, near Orlando, authorities said. The child's parents said they know Caballero as "Sister Mary," but officials of the Catholic diocese of Orlando told CNN that Caballero is not a nun and is not part of the diocese. The parents told the sheriff's office that after Maria was born, Caballero became overly eager to help care for her and even offered the family $2,000 to have Maria permanently. But the parents refused, according to police. "She just really had a controlling demeanor about her, in terms of spending time with the child,' said Herrell of the sheriff's office, referring to Caballero. "She tried to purchase the child, and used threats and intimidation against the parents to have control and access to the child. She threatened to deport them and report them to DCF (the Florida Department of Children and Families) to try and control them," he said. According to sheriff's officers, at one point the parents notified police in Eustis that Caballero had Maria and was refusing to return her. The couple did not file charges because their daughter was eventually returned to them. That's when, authorities said, the parents decided to move to South Carolina to get away from Caballero. But in July, according to authorities, the couple lost another child at birth, and Caballero allegedly arrived on the scene and was able to convince them to allow her to take Maria to another relative's home in South Carolina while the parents grieved. Instead, police say, Caballero allegedly fled the area and returned to Florida, refusing to return the child. Federal investigators determined that Caballero took Maria with her to Argentina in August. An arrest warrant was obtained, charging Caballero with false imprisonment under Florida law. Last month, Caballero landed in Miami on a return trip from Argentina, without the child, and was arrested. She was questioned by the FBI but invoked her right to counsel. She refused to cooperate, according to law enforcement officials. The next day, she posted $10,000 bond and was freed. She later met with law enforcement officials and gave up her passport, authorities said. Federal officials determined that the baby was in Argentina with a friend of Caballero's, Andrew Hendrick, who identified himself to authorities as an associate director of the St. Filumena Church back in Florida. "We're trying to determine whether there was any criminal activity on his part," said Herrell of the Lake County Sheriff's Office. Hendrick accompanied the baby on the flight back to the U.S., according to Herrell. Caballero's defense attorney, Ron Fox, told CNN that he does not comment on pending charges. He said that his client's story is substantially different from the baby's parents and that his client has cooperated with law enforcement. "This was a cooperative venture," said Fox, in a telephone interview with CNN. "Ms. Caballero paid for travel and made all of the travel arrangements back to the U.S. for the baby and her friend," he said. When asked why she took the child, Fox replied, "That's act two. You'll have to wait and see. That will all come out in a public courtroom." Then he added, "It was not a surprise to the parents." Caballero remains free on bond. She is scheduled to be arraigned on February 16.